And there are many types of akok too. One day, during Ramadan Bazaar in Serdang, Selangor, I saw some akoks being sold. So I bought some. URRGHHHHH! It was disgusting! It tasted like a soggy cake, almost a syrup soaked bahulu that reeked of imitation essence. Eeewww! My colleagues consoled me, and said that sounded bad. And told me, if ever I go to Kelantan, I must get some that is locally made. Indeed I did. I was converted by Nik Yam, the royal kuih maker. I didn't know that it could be so delicious. I bought quite a lot and brought back for my family to try and it wasn't enough to go around. Everybody liked it a lot! It was the favourite among all the kuihs that I brought back. I made this just yesterday because I was contemplating whether I should make this, because I know Gertrude will me making these too. Usually the host and organizer will not make the same thing because we want to expose you all to a variety of state food, but since I've done the minimal 3, I just got to make these and eat to my heart's delight. This recipe that I used is not as sweet as Nik Yam's. I was wanting to make more, so I made 18 pcs with this recipe in tart pans of which was a mistake. They grew quite wide and thin. I should have made just 12. Although I used a higher temperature with the same timing, it didn't seem enough. Maybe my pan wasn't dark coloured, so it wasn't as 'hot'. 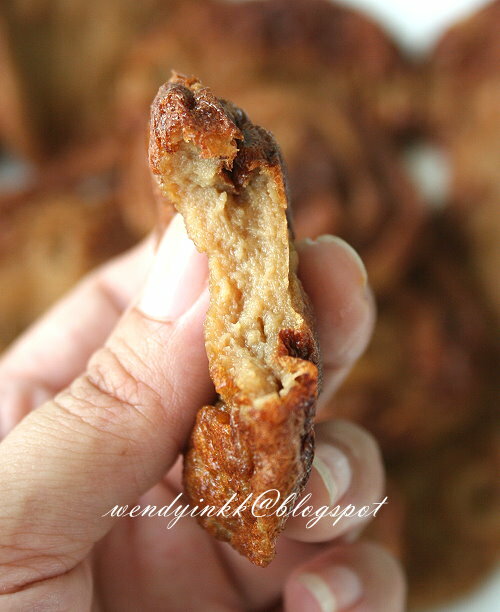 Longer baking time will give a more holey kuih, that is distinct of akok kedut. I totally recommend baking it longer than 10 mins. But still mine tasted good without the holes, soft custardy with a fragrant soft (slightly chewy) crust. Now, if you love palm sugar, if you love coconut. And if you love to eat egg tarts, especially the filling.... the filling that has the texture like portuguese egg tarts. 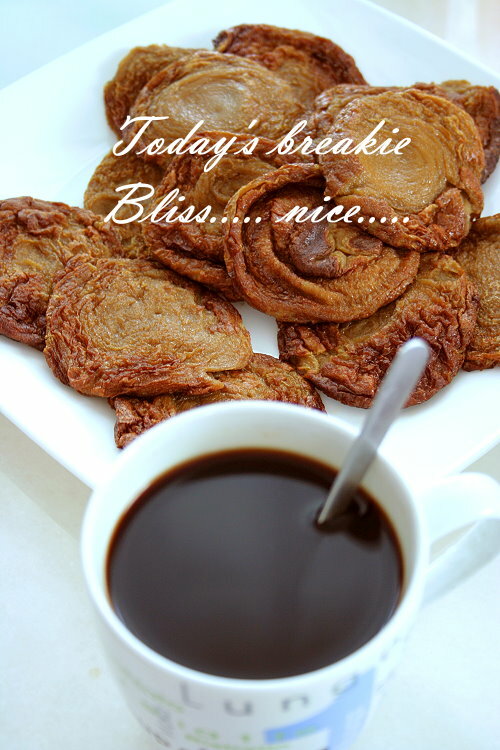 Do give this ugly wrinkly kuih a chance to give you paradise. If you are not familiar wih the local food, imagine deflated tropical yorkshire pudding, fluffy tropical sweet custard... almost like that. 1. Preheat oven to 200(fan)/220C. 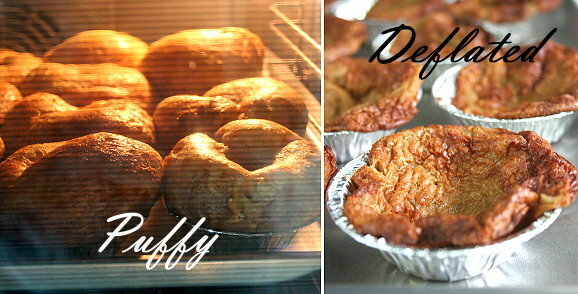 Prepare a non stick muffin tin or disposable aluminium egg tart pans. Drop few drops of oil into the pans. Put these pans into the oven to preheat together. 4. Strain in coconut milk and palm sugar syrup. Discard the pandan shreds. 6. Bake them for 12 minutes or until the surface is golden brown. I am more used to the Terengganu akok so the Kelantan one looks funny to me. But I know that it is good! i wish to try coz i love palm sugar n coconut combo!! Hi, I'm kelantanese. These akoks have high content of eggs compare to those smooth akok. It'll taste better if u refridgerate them. fuiyoh.... looks damn good leh!!! this looks so yummy! I always think I've eaten everything singaporean/malaysian out there (I'm very greedy) but I've yet to try this! thanks so much for sharing and teaching me somethign new! 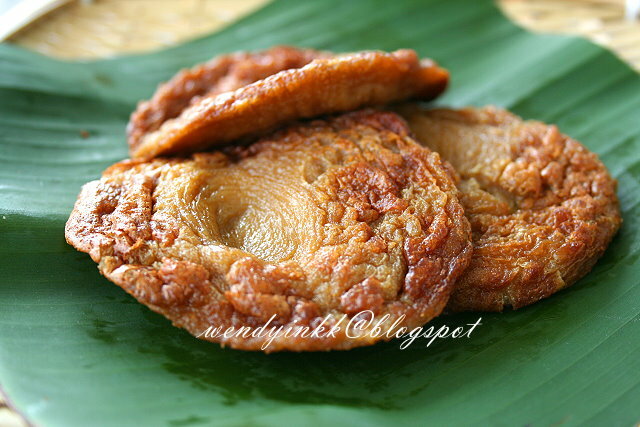 As a Kelantenese, to me your akok is perfect. This is my forever favourite kuih. You have made it perfectly. Congratulation. Wow, they look so delicious! I can't wait to try your recipe... But I have a question, when you pour the batter, do you fill the muffin tin full or 3/4 full? It depends on your mould. Wendy, thanks for your replies! I just made this today, i like it so much! it is like eating coconut and palm sugar flavored egg tart filling! Hi Wendy, thanks for sharing this awesome recipe. May I ask why my akok did not turn out wrinkly like yours? 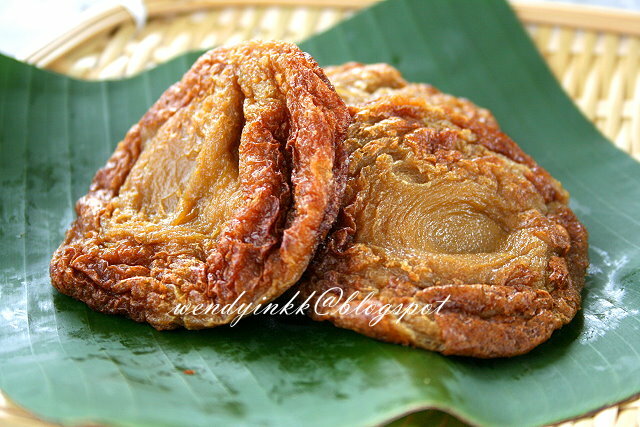 All my akok turned out to have smooth top which varies from Kelantan akok. I really appreciate if you could advise what went wrong. FYI, I use Ayam brand UHT coconut milk. Thank you. Two reasons, either you were too gentle at Step 3, or your oven is not hot enough. But even if step 3 wasn't vigorous enough, it's the high heat that makes it expand, then deflate to get wrinkly.